Do not install a storm door if it is facing south or southwest. The heat buildup between the storm door and steel exterior door could melt the window moldings or even warp the door. The two doors shown to the right are self-storing, which means that all the glass and screen sections are stored within the door. This makes it easy to lower a storm and expose the screen. There are also full size stormdoors, see picture below, where the glass panel is held in place by clips. If so desired the glass panel can be removed and replaced by a full screen panel. A storm door is installed in front of an exterior access door to protect it from bad weather and allow ventilation. Storm doors typically have interchangeable glass panels and window screen panels to provide visibility and prevent flying insects from entering the home. 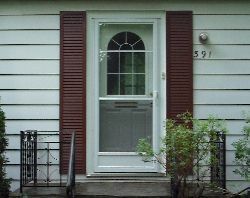 Storm doors are typically made from aluminum and plastics such as vinyl (PVC) and fiberglass. The main advantage of aluminum is that it is corrosion resistance. Aluminum storm doors do not need to be painted repeatedly to protect them from the elements. Aluminum storm doors are available in a variety of thicknesses. All of these thicknesses can accommodate interchangeable glass and screen panels. 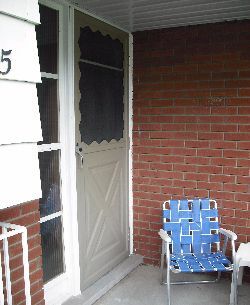 The least expensive storm doors are the thinnest. As the storm door frame gets thicker, the door frame becomes more rigid. The strength and rigidity of the door is limited however, by the relatively brittle aluminum alloy corners that hold the frame together. If the door gets blown open during a storm, the corners can crack and the door will lose its strength. The corners however, can be replaced if parts can be found. Materials such as PVC and fiberglass offer the most corrosion resistance of all when used in a storm door. They can also be molded in such a way as to realistically mimic wood grain to provide the appearance of a wooden storm door. PVC or vinyl storm doors often require internal steel frames to provide the necessary strength to the door. However, extruded PVC doors offer extraordinary strength. 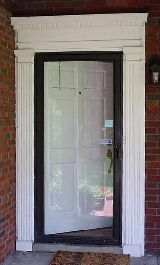 Fiberglass storm doors are more expensive than vinyl doors. Storm doors come basically in two different styles. 1. Full view. A full view storm door means that there is a full length glass panel that has to be physically changed out if you want a screen in it. The unused panel of glass or screen is then stored for future use. 2. Ventilating. The self storing storm door has one glass panel and one screen panel in the door at the same time. The glass panel moves up or down in order to reveal the screen. This is convenient if you want to get cross ventilation in the house without the headache and hassle of removing and storing a glass or screen panel. If the door is lightly soiled make a mixture of mild detergent and water and apply light pressure on the scrubber to clean the door. Use clean water to rinse the door. Don't forget to clean the door handle as well. If the hinges are not self-oiling apply some lubricants. If the door has not been cleaned for a while and is heavy soiled you may need a stronger solution. You may want to add a cup of common household ammonia to a bucket of water and mix well. Apply more elbow grease to the scrubber when cleaning the door and rinse well after you are done.